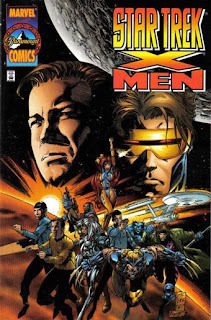 SINGAPORE COMICS & COLLECTIBLES: STAR TREK/X-MEN #1 (1996) "Star TreX"
STAR TREK/X-MEN #1 (1996) "Star TreX"
Written by Scott Lobdell. Pencils by Marc Silvestri, Billy Tan, Anthony Winn & David Finch. Background assists by Brian Ching. Inks by BATT, D-Tron, Billy Tan, Aaron Sowd & Joe Weems V. Ink assists by Victor Llamas, Team Tron, Jose 'Jag' Guillen, Viet Troung & Mike Manczarek. Pin-up gallery by: Terry Dodson & Rachel Pinnock, Mike Deodato, Jr., Steve Epting, Gary Frank & Cam Smith, Joe Bennet, Pascal Ferry & John Dell, Val Semeiks & John Dell. Cover art by Marc Silvestri.